Heat oven to 400°F. Cover cookie sheet with foil; set aside. In 4-quart saucepan, cook all filling ingredients except toffee caramel dip over medium heat about 5 minutes, stirring occasionally, until butter melts and mixture develops "juice." Unroll 1 crust; smooth crust with hands. Sprinkle 1/4 cup of the pecans on crust, leaving 1 1/2 inches around edge. Using rolling pin, press pecans into crust without them breaking through other side of crust. Run spatula under crust; place in ungreased 9-inch glass pie plate, pecan side up. Spoon other half of filling mixture on top. Unroll second crust; smooth crust with hands. Sprinkle remaining 1/4 cup pecans on crust, leaving 1 1/2 inches around edge. Using rolling pin, press pecans into crust without them breaking through other side of crust. Place crust over top of filling, pecans side up. Seal edge and flute. 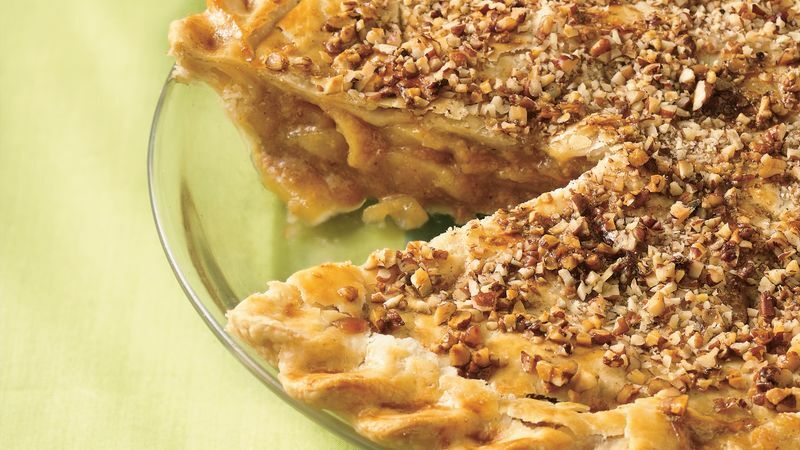 Stir together egg and half-and-half; lightly brush over entire crust, including fluted edge, brushing gently on areas that have pecans. Sprinkle evenly with sugar crystals. Cut 2 slits in top crust. Place pie on foil-covered cookie sheet. Bake 20 minutes. Reduce oven temperature to 350°F. Bake 40 to 45 minutes longer or until juice begins to bubble through slits in crust and crust is golden brown. Cool 1 hour 30 minutes before serving.